Woodwork is an art and to many – a forgotten or ‘dark’ art. 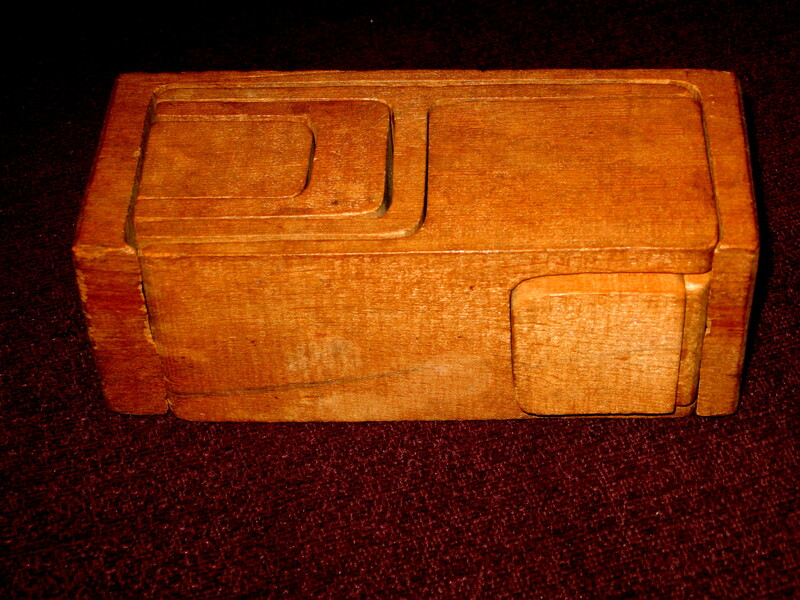 Woodwork is used in architecture, modelling, music, furniture, automobiles, education, toys and it is also collectable. At times I have just stated some facts, or given some opinions or just wondered about things I see and take pictures of. This time, I’m asking for a little help. I have two photos of the same item here. I used to play with this as a child, when I visited my grandparents’ home. As a child you take a lot for granted and accept things for what they are. However, as we age, we see things in a new light and often what we saw and accepted as ‘the obvious,’ at the time, becomes a point of consternation when we suddenly realise the complexities of what we were looking at. For further details on this topic, see original post. Lucerne’s Chapel Bridge is a charming covered wooden footbridge which crosses the Reuss River over Lucerne, Switzerland. 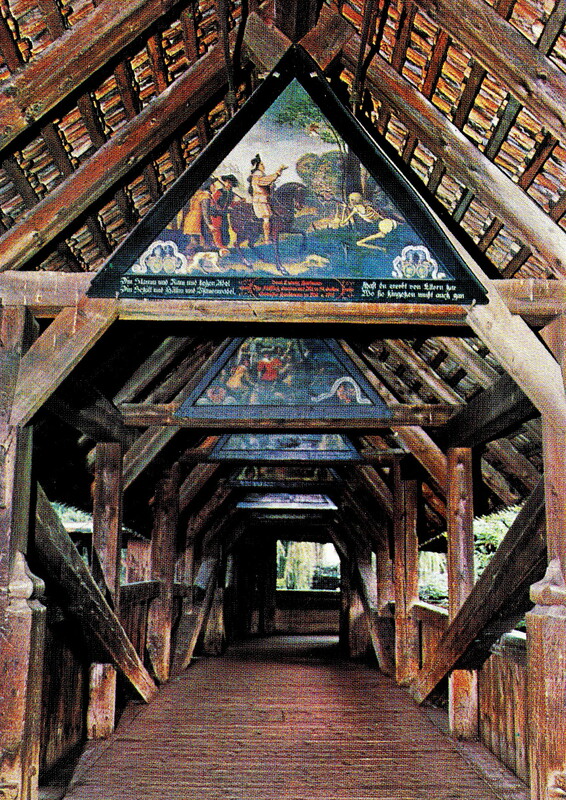 The bridge was named after St. Peter’s Chapel and its uniqueness and popularity is due to its exquisite, triangular paintings by Hans Heinrich Wägmann, who depicted Lucerne’s history in the triangular architraves of the bridge. The original panels were mostly made from spruce, although some were made from linden wood or maple boards. Unfortunately, due to a destructive fire on 18th August, 1993, which destroyed two-thirds of the bridge, many of these original paintings were destroyed. After the fire, the remains of 47 paintings were collected, although only 30 could only be fully restored. The Kapellbrücke was reconstructed and re-opened to the public on April 14, 1994. Mulga-Wood -has been used extensively for Australian souvenir and gift-ware throughout the middle of the 20th century and is largely considered ‘kitsch’. Its height of popularity probably began in the Inter-war Years and continued through to the 1960s and 1970s. Mulga or true mulga is a shrub or small tree, native to arid outback areas of Australia. (acacia aneura). The Aboriginal people have long used mulga for digging sticks and woomeras due to its strength. 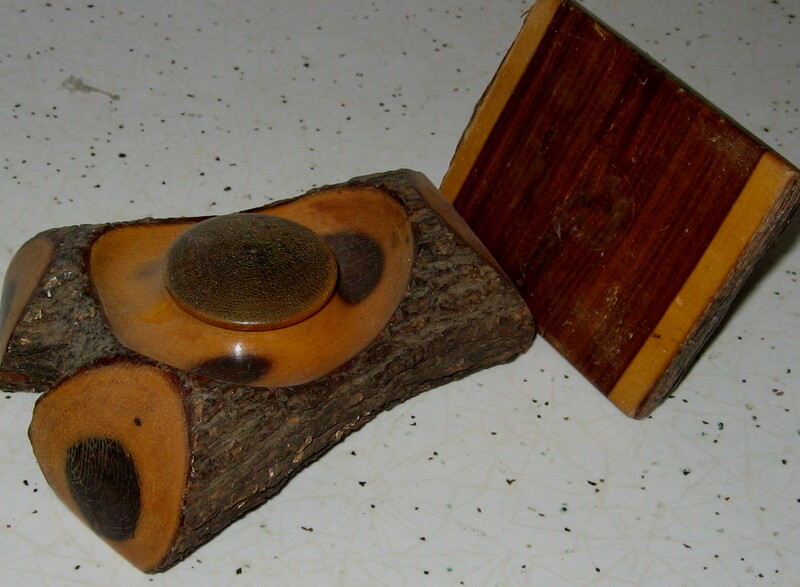 This photo shows some examples of use for mulga-wood. Back to Decorative Arts page.